Previewed in Vegas this past week at a Nike Elite event ,beside the Laney V was another Retro 5 colorway. This colorway was very similar to that of the Grapes coming out in May. Except they were Black! and feautred a suede upper. We mocked up this photoshop rendering to show you what they potentially could look like. STAY TUNED FOR MORE INFO REGARDING THESE "Aqua" 5's and actual images. Remember you heard it from TCC first! With the rumors of a return of the Steel X'S this year we managed to get our hands on a rare sample that maybe a few of you have not seen. This sample was produced in 2004 and never made it to stores. The Only thing different about this sample is the yellow jumpman on the bottom of the shoe. The pairs that actually made it to stores did not contain any yellow at all. We are not sure have JB went the Yellow jumpman route or why this sample was scrapped. Stay tuned for more info on a possible return this year, maybe the 2013 Pair will feature the yellow jumpman. Been years since we have seen the release of the Jordan 16, only other retro to be released came in the 2008 CDP pack. Many Older Jordan heads have been waiting a long time to see a release of their middle school favorites. Looks like that time is nearing. Here we have a FALL 2012 sample of the Jordan 16 Cherrywoods. The shoe holds true to is OG counterpart with the biggest difference being the color chance of the inner upper. 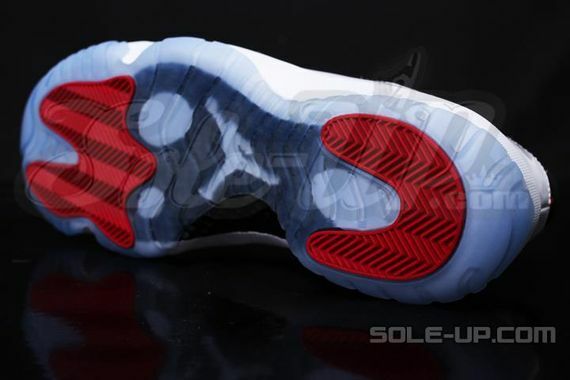 Even though sample tag says 2012 expect these to drop late 2013 or Early 2014. Check out these samples for now until the Retro's finally drop. Jordan Brand loves springing surprises our way, out of the blue today JB annouced a Special auction that included a Collaboration with the Grat Don C. This auction will feature 37 pairs of specially designed Retro 1's featuring a anaconda skin pattern, heel strap and Orange Highlights. The BHM theme is attached to this shoe and will help raise money for Big Brothers/sister of America. Look for these special auctions to go for a huge amount, with most going to big name celebs. The auction will last 6 days, good luck to all those looking to cop. After the First release of the Raygun Barkley posite max had so much succes Nike will continue to Drop there new Hybrid in various colorways. We have already showed you the "Eggplant" color dropping March 2nd Now a new colorway has popped up. This colorway obviously pays homeage to Barkley's time as a 76'er. The Foam upper is done in a royal blue with hints of Varsity red. Just like the other Posite colors the bottoms also will glow in the dark. Stay tuned for more images and info regarding a release of this colorway. The classic and still popular hybrid will be making a few more apperances this year. The next upcoming colorway is a combination of some strange colors, but overall it turned out pretty good. We have here the upcoming 3M McDonald's colored Spiz'ike. The upper consist of a graphite suede, with yellow contrast stitching. Red and Yellow highlight the shoe in various places giving it that good ol Mickey D's feel. The shoe also combines 3m Paneling in certain area's. Look for these to Drop early March. Will this be a for sure cop your you? Check the detailed pictures we have for you. After being seen on the feet of NBA superstar Carmelo Anthony, the All red colored Retro 4 was the topic of many sneaker blogs asking and wondering if they would ever release. I guess the sneaker gods heard those crys becuase releasing in July will be the "Toro Bravo" or "Bull Away" Retro 4. The nickname Red suede was given to these early based on the fact that Melo's PE featured a all red Suede upper, but sorry guys the ones you will be getting in July will not be suede but its counterpart Nubuck. You see in these detailed first look pics the Completely red Nubuck upperm with hints of white, black and cement grey hightlighting the sneaker. How do you feel about the shoes now after finally seeing actual images and knowing there will be no suede?